Probably for the first time, here is a complete set of colors for VVS aircraft during World War II. Thanks to cooperation with Eric Pilawskii and his book on Soviet Fighter colors, White Ensign has been able to formulate accurate colors based on his research into this long overlooked subject. 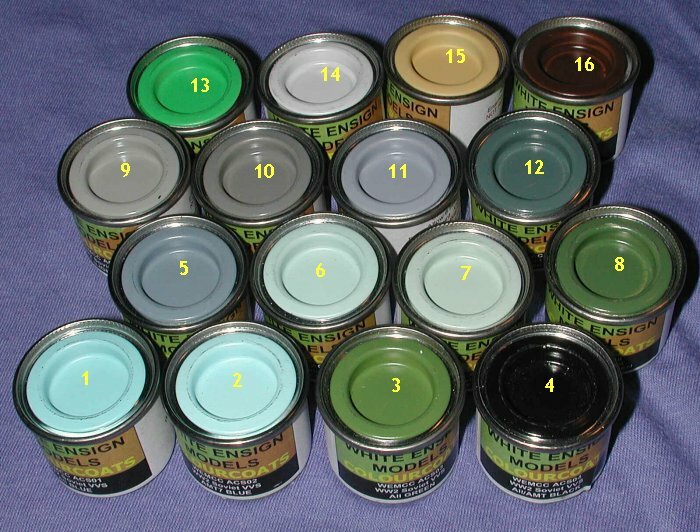 There are sixteen paints in this series and it contains both the early AII colors and the later AMT ones as well as various primers and interior colors. Also included is a very bright tractor color used by one particular factory to paint aircraft until standard colors were made available. Just for a bit of information, the AII colors were those in use at the beginning of the war so you'd find these used on Yak-1s, Lagg-3s and Mig-3s, for example. The AMT colors were later war and so these would be found on La-5/7s and Yak-3/9 fighters, though there were exceptions as well as field applications which used non-standard paints. Without further ado, here is a listing of what is available. You can match the numbers on the photo with this listing. I'm personally quite pleased that White Ensign has taken the plunge into providing us with all of these excellent colors. My experience with their WW2 USN colors is nothing but positive. The grain in the paint is very fine and produces an excellent finish. Best of all, at least to me, is that they are enamels. Now there is no excuse for not having your model painted properly. If nothing else, it will keep the Kolor Polizei at bay! I know that I'll be using them on my next VVS aircraft kit! If you are unable to hound, pester and threaten your local hobby shop into handling these paints, you can order them direct via the logo below. Thanks to for the review samples. Click on the logo to visit their website.